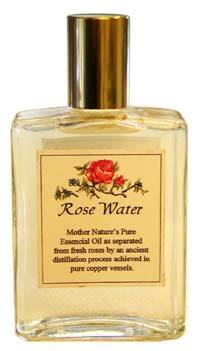 Rose water is a "co"-product of the same rose oil distillation process for the oil used in "Rose Embrace" and is only from the most concentrated "first catch" of rose water hydrosol. This "first catch" is then redistilled and initially contains suspended rose oil, and cannot be made anymore concentrated in this process. The 2 oz. size has the rose scent of conservatively 200 roses, the 4 oz. size 400 roses. This alcohol free hydrosol can be used as a cologne, bath splash, message material, or as an ingredient in cooking. These are estate made scent products with no pesticide or fungicide sprays. We have many testimonials to its superior fragrance and strength. Available in 2 oz. (includes spritzer and over-cap) and 4 oz. size. Comes with 14 food and 2 beauty recipes.